Original image by Chris Martin wildlife photography. This image captures a typical sighting of an African darter. The original image was captured at popular birding spot, “lake Panic” in the Kruger National park. 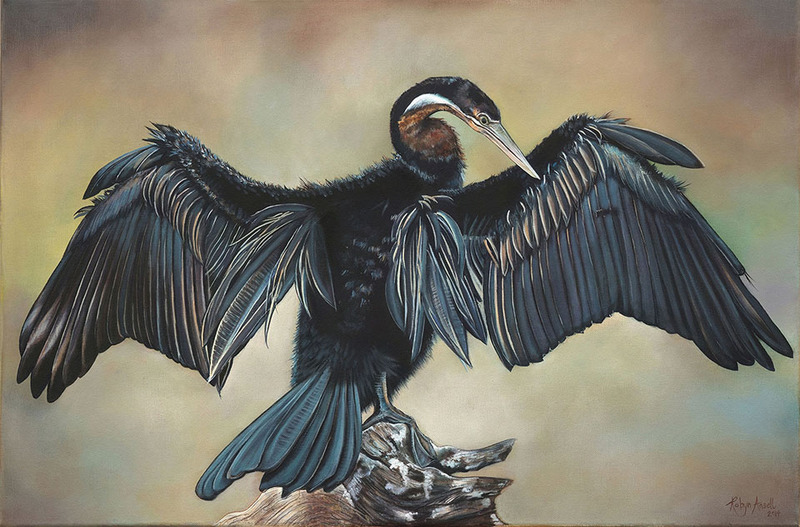 I was immediately drawn to the detail in the image, the sheen on the wings and tail feathers, the texture of the log on which the bird is perched. I especially love the simplistic background of this image; the darter himself is rather complex with regards to colour and detail so the soft tones of the background are complimentary to this. This was not an easy painting to complete, the blue tones captured in the original image seem almost unrealistic and there were quite a few times during the painting process where I doubted the choice of colours I had decided to work with. The sheen on the wings is also somewhat over emphasized and I thought it maybe looked a bit too intense, but at the end of the day I think that anyone who has watched one of these magnificent birds sunning their water –sodden feathers alongside rivers and dams in the African wilderness should be able to identify with this work.